Mornings in Jenin is a contentious book, one which goes to the heart of the Palestinian-Israeli conflict. Susan Abulhawa is a Palestinian-American, whose own life story led her to human rights activism, and she is an outspoken critic of Israel and its military campaigns. Her novel is a catalogue of wrongs perpetrated against Palestine since the inception of the State of Israel and it is quite draining to read. The novel follows the Abulheja family, Yehya and Basima and their two sons, in the Palestinian village of Ein Hod, and how they fare as Israel is established in their ancient homeland. Flouting convention, Hasan falls for a Bedouin girl, Dalia, and marries her, but tragedy strikes when during the Zionist invasion of their village, an Israeli soldier called Moshe gives way to impulse and steals their one of their twins, baby Ismael, for Jolanta, his childless wife, who is a Holocaust survivor who lost her entire family. They rename the baby David, and he disappears out of the story but the reader knows there will be a reunion because he is so recognisable due to scarring on his face. This wicked theft of a child to recompense an individual for a great wrong done to them, is a not-very-subtle symbol of the taking of Palestinian land to recompense Jews for a great wrong done to them. From this not very convincing beginning, the novel improves. The focus is on Amal, Hasan and Dalia’s daughter and how, orphaned and injured in the 1967 war, she eventually comes to be in America with her daughter Sara. Her childhood and adolescence deals with her mother’s sorrow and mental health; and with the restrictions of occupation – poverty, soldiers, brutality, intrusive identification procedures and the sense of abandonment by the international community and a United Nations powerless to enforce its own resolutions. 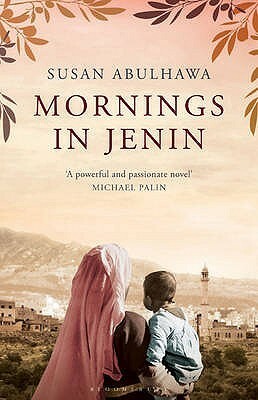 Unlike other occupation novels I have read where the focus has been on the choices people have to confront, Mornings in Jenin shows that the Palestinians usually have no choices to make except to endure. When eventually they begin to fight back, their efforts are ineffectual and result in terrible reprisals. Whether the reader regards them as terrorists or freedom fighters, the young men involved in resistance end up fragmenting their families still further. For her own safety, Amal makes her way to America ahead of her husband Majid, while her brother Yousef joins the struggle that will bring him into conflict with his missing brother David/Ismael. And tragedy strikes again. Unfortunately the novel loses its narrative drive once Amal is in America; it becomes passionless and undirected. An uneasy blend of high drama, historical events and incongruous excerpts from analysts of Middle Eastern politics such as Robert Fisk, from this point on the novel never really transcends its didactic purpose. It’s as if it has been written to teach pro-Israeli or ignorant Americans about something they don’t wish to hear, that is, about the sufferings of the Palestinians and the injustice they have had to endure. Its worthy aims get lost, however, in its melodramatic plotting, its relentless sentimentality and some hopelessly unrealistic characterisation. And while I don’t doubt that families in Palestine have suffered tragic losses over decades of this most uneven conflict, Mornings in Jenin is a novel, and as a novel, it suffers from a surfeit of tragedy. I have seen some fine films such as The Lemon Tree; The Band’s Visit; and The Other Son which humanise the Middle East Conflict, and I thought that Touch was a powerful voice for Palestine (see my review) but Mornings in Jenin was a disappointment. Source: Personal library, purchased from Benn’s Books, $32.99. Thank you for the review. I was looking forward to reading this book, after I read Abulhawa’s ‘The Blue Between Sky and Water’, which moved me. I am sad that this was a disappointment. Lisa, I agree, “Its worthy aims get lost, however, in its melodramatic plotting, its relentless sentimentality and some hopelessly unrealistic characterisation.” I was disappointed in the novel too and think authenticity and the opportunity to engage readers emotionally was lost, which was sad because it’s a story often misrepresented and the origins forgotten about or disregarded. Spot on, Mairi, I agree… the world needs to hear Palestinian voices, as we need to hear from other parts of the Middle East as well. (I’m reading an Egyptian novel at the moment and it’s good to see their point-of-view). I think this would have been better without the baby theft story, and had omitted the Palestinian-in-exile elements in America. Apart from anything else, it made it look too easy to leave, when we all know that it’s not. And that absurd ending! #AvoidingSpoilers I got to that, and thought, this is what should have held the novel together… properly crafted, it would have been only too realistic, but it just felt like a tacked-on episode of a soap opera. Sounds like you were better off reading scholarly papers! Although the novel does seem to have its good points too. I have never read any fiction from a Palestinian perspective. Do you have any recommendations? I would recommend Touch (follow the link that’s in this review) but apart from that, I’m like you, I’d like to read a good novel from Palestine (and by a Palestinian author, not one who left the county in her childhood). But I have yet to find one. Thank you for the links! Much appreciated. And you bring up an excellent point about how difficult it must be for Palestine to have a publishing industry in the first place. You can see the author’s point of view, It must be so difficult to put the Palestinian case in America, when the prevailing consensus is so in favour of Israeli suppression of all rebellion against occupation. Yes indeed, until recently the Palestinians didn’t get much air time in Australia either, and even now it’s usually hostile. But that’s why it matters that a book like this should be the best it can be, they’d win more hearts and minds if they could present a compelling case in a great work of literature. Look how Gone with the Wind made everyone think that Mammy and the other slaves had a good life on the plantations!